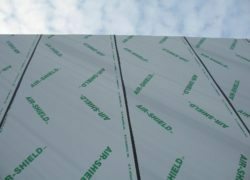 AIR-SHIELD SMP is a self-adhesive, vapor permeable, air/liquid moisture barrier that is designed to be fully bonded to the substrate without the use of an adhesive or primer. AIR-SHIELD SMP is a tough, durable membrane that exhibits excellent resistance to air leakage and liquid water intrusion, while at the same time allow vapor to readily pass through to allow the wall assembly to dry. AIR-SHIELD SMP has been specifically formulated to act as an air and liquid moisture barrier, allowing vapor to pass through it. It may be applied to most common surfaces and integrated into various wall assemblies. AIR-SHIELD SMP is suitable for both new construction and retrofit applications and works equally well as an air barrier on precast concrete, cast-in-place concrete, masonry (concrete block), interior and exterior gypsum board, Styrofoam, primed steel, aluminum mill finish, anodized aluminum, primed galvanized metal, drywall, and plywood. When properly applied, helps reduce air and moisture intrusion. Bonds easily and securely to a variety of building materials – no primer required. Excellent adhesion – remains firmly bonded to the substrate. High vapor permeability – allows the transmission of moisture vapor through porous building materials. Can be left exposed to UV for a maximum of 90 days. Tough, durable membrane helps resist punctures and tears during the installation process. Sheet-applied – no costly spray equipment or enhanced protective gear needed during installation. Can be installed in a wide range of temperatures. AIR-SHIELD SMP can also be cut to widths of 2.95″ (75 mm), 5.91″ (150 mm), and 11.81″ (300 mm). Exceeds ABAA maximum assembly air leakage requirements when tested in accordance with ASTM E 2357. Exceeds ABAA maximum material air leakage requirements when tested in accordance with ASTM E 2178. Refer to AIR-SHIELD SMP INSTALLATION GUIDELINES document for complete installation instructions. Surface Preparation … All surfaces to be protected must be clean, dry, frost-free, and smooth. Remove any sharp protrusions and repair all defects. All surfaces to receive AIR-SHIELD must be clean of oil, dust, and excess mortar. Strike masonry joints flush. Concrete surfaces must be smooth and without large voids, spalled areas, or sharp protrusions. Concrete must be cured a minimum of 14 days and must be dry before AIR-SHIELD is applied. Where curing compounds are used, they must be clear resin-based, without oil, wax or pigments. Prepare substrate per manufacturer’s instruction prior to application of membrane. Application Method … AIR-SHIELD SMP should be installed with a hand roller and stiff brush to create a continuous and effective bond with the substrate. Always install with an overlap, with the upper courses lapped over lower courses, in a shingle fashion. All horizontal and vertical overlaps should be a minimum of 2 ½” (63.5 mm). AIR-SHIELD SMP can be applied at minimum air and surface temperatures of 32º F (0º C) and rising. Pre-cut material to required length. Apply membrane to surface by removing release paper and rolling membrane firmly into place. Remove release paper only as membrane is being applied. Using a hand roller or stiff brush, roll press the membrane into place to ensure full adhesion to the substrate. Remove all wrinkles and/or fish mouths. Overlap subsequent courses of membrane a minimum of 2 ½” (63.5 mm). Cut AIR-SHIELD membrane with a utility knife to detail around protrusions and masonry reinforcing. Seal all membrane terminations, penetrations, and protrusions with AIR-SHIELD LIQUID FLASHING. At the end of each working day, protect the leading edge of AIR-SHIELD SMP with a bead of AIR-SHIELD LIQUID FLASHING. Rough Openings and Penetrations … AIR-SHIELD SMP can be used for detailing of rough openings and is to be installed in accordance with AIR-SHIELD SMP Installation Guidelines and W. R. MEADOWS published details. Alternatively, AIR-SHIELD LIQUID FLASHING can be used. Through Wall Flashing … AIR-SHIELD THRU-WALL FLASHING is to be used for all concealed flashing installations. All areas where AIR-SHIELD THRU-WALL FLASHING is to be installed requires application of MEL-PRIME™ prior to installation. AIR-SHIELD THRU-WALL FLASHING should be recessed 1/2″ (13 mm) from the face of the masonry. Failure to roller the membrane effectively may result in poor adhesion to the substrate. AIR-SHIELD SMP should only be applied in dry weather when air and surface temperatures are above 32° F (0° C). Do not install AIR-SHIELD SMP in adverse weather conditions. AIR-SHIELD SMP is not designed for permanent exposure and should be covered within 90 days of installation. Refer to safety data sheet for complete health and safety information.